Hemoglobin or haemoglobin (frequently abbreviated as Hb) is the iron-containing oxygen-transport metalloprotein in the red cells of the blood in mammals and almost all other vertebrates. Some invertebrates also employ hemoglobin in oxygen transport, such as annelid worms, which have the hemoglobin dissolved in the blood, and the larval aquatic stages of a few insects. Only a few vertebrates, such as eel larvae and some species of Antarctic "icefish," have been found to lack hemoglobin. Hemoglobin is the most efficient oxygen-carrier known. A protein-metal complex, hemoglobin binds loosely and reversibly with oxygen under suitable conditions and then releases the gas under other conditions. In vertebrates, hemoglobin transports oxygen from the lungs or gills to the rest of the body, such as to the muscles, where it releases the oxygen load. Structurally, hemoglobin is a globular protein with an embedded heme (or haem) group; each heme group contains an iron atom, and this is responsible for the binding of oxygen. The most common types of hemoglobin contains four such subunits. Mutations in the gene for the hemoglobin protein result in a group of hereditary diseases termed hemoglobinopathies, the most common members of which are sickle-cell disease and thalassaemia. Because carbon monoxide binds preferentially to hemoglobin over oxygen, smoking tobacco can greatly impact oxygen transport, blocking up to 20% of the oxygen active sites on hemoglobin. This is just one of the many serious, health related effects of tobacco smoking, and represents a degrading of the human body. The body is considered by many religious faiths to be a "temple of God," which should be spiritually and physically treated with the utmost sanctity. Hemoglobin provides a great deal of symbolism in human culture. Hemoglobin provides the red color in blood, being bright red when oxidized and dark purplish red when unloaded. The color red has been used to represent blood, war, and Mars. As with hemoglobin, the red color of Mars is also attributed to iron oxides. Hemoglobin has been used to determine evolutionary relationships. The alpha chains of humans and chimpanzees have identical sequences of amino acids, whereas humans differ by one amino acid (our of 141) from the gorilla, and 25 from rabbits, and 71 from carp. The hemoglobin molecule is an assembly of four globular protein subunits. Each subunit is composed of a protein chain tightly associated with a non-protein heme group. Each individual protein chain arranges in a set of alpha-helix structural segments connected together in a "myoglobin fold" arrangment, so called because this arrangment is the same folding motif used in myoglobin proteins. This folding pattern contains a pocket that is suitable to strongly bind the heme group. 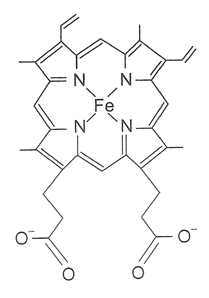 A heme group consists of an iron atom held in a heterocyclic ring, known as a porphyrin. This iron atom is the site of oxygen binding. The iron atom is bonded equally to all four nitrogens in the center of the ring, which lie in one plane. Two additional bonds perpendicular to the plane on each side can be formed with the iron to create the fifth and sixth positions, one connected strongly to the protein, the other available for binding of oxygen. The iron atom can either be in the Fe+2 or Fe+3 state, but ferrihaemoglobin (Methaemoglobin) (Fe3+) cannot bind oxygen. There are a variety of hemoglobin molecules, which may be more effective under different conditions. For example, one type may be more effective at higher elevations, such as that in a llama, and others at lower elevations, such as the white-tailed deer. Embryonic hemoglobin is also different from the hemoglobin of the mother. In adult humans, the most common haemoglobin type is a tetramer (which contains 4 subunit proteins) called hemoglobin A, consisting of two α and two β subunits non-covalently bound. This is denoted as α2β2. The subunits are structurally similar and about the same size. Each subunit has a molecular weight of about 16,000 daltons, for a total molecular weight of the tetramer of about 64,000 daltons. Haemoglobin A is the most intensively studied of the haemoglobin molecules. The four polypeptide chains are bound to each other by salt bridges, hydrogen bonds, and hydrophobic interaction. There are two kinds of contacts between the α and β chains: α1β1 and α1β2. Hemoglobin A (α2β2)- The most common type. Hemoglobin F (α2γ2) - In adults Haemoglobin F is restricted to a limited population of red cells called F cells. In the tetrameric form of normal adult hemoglobin, the binding of oxygen is a cooperative process. The binding affinity of hemoglobin for oxygen is increased by the oxygen saturation of the molecule. 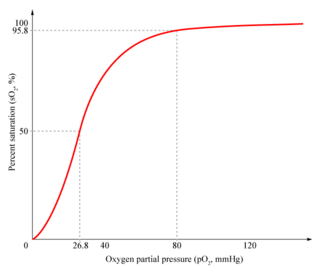 As a consequence, the oxygen binding curve of hemoglobin is sigmoidal, or 'S' shaped, as opposed to the normal hyperbolic (noncooperative) curve. This positive cooperative binding is achieved through steric conformational changes of the hemoglobin protein complex: when one subunit protein in hemoglobin becomes oxygenated it induces a confirmation or structural arrangement change in the whole complex, causing the other 3 subunits to gain an increased affinity for oxygen. A single hemoglobin molecule can transport four oxygen molecules. In vertebrates, hemoglobin is found the erythrocytes or red blood cells, each of which contains about 300 million hemoglobin molecules. Hemoglobin in the red blood cells transports about 98% of the oxygen carried by human blood. The binding of oxygen is affected by molecules such as carbon monoxide (CO), such as emanating from tobacco smoking, car exhaust, and furnaces. Hemoglobin's affinity for oxygen is decreased in the presence of carbon monoxide because both gases compete for the same binding sites on hemoglobin, carbon monoxide binding preferentially to oxygen. Hemoglobin's binding affinity for carbon monoxide is 300 times greater than its affinity for oxygen, meaning that small amounts of carbon monoxide dramatically reduces hemoglobin’s ability to transport oxygen. When hemoglobin combines with carbon monoxide, it forms a very bright red compound called carboxyhemoglobin. When inhaled air contains carbon monoxide levels as low as 0.02%, headache and nausea occur; if the concentration is increased to 0.1%, unconsciousness will follow. In heavy smokers, up to 20% of the oxygen active sites can be blocked by carbon monoxide. Thus, blood with high carbon dioxide levels is also lower in pH (more acidic). Hemoglobin can bind protons and carbon dioxide, which causes a conformational change in the protein and facilitates the release of oxygen. Protons bind at various places along the protein, and carbon dioxide binds at the alpha-amino group, forming carbamate. Conversely, when the carbon dioxide levels in the blood decrease (for example, around the lungs), carbon dioxide is released, increasing the oxygen affinity of the protein. This control of hemoglobin's affinity for oxygen by the binding and release of carbon dioxide is known as the Bohr effect. Hemoglobin also has competitive binding affinity for sulfur monoxide (SO), nitrogen dioxide (NO2), and hydrogen sulfide (H2S). The iron atom in the heme group must be in the Fe+2 oxidation state to support oxygen transport. Oxidation to Fe+3 state converts hemoglobin into hemiglobin or methemoglobin, which cannot bind oxygen. Nitrogen dioxide and nitrous oxide are capable of converting hemoglobin to methemoglobin. A variant hemoglobin, called fetal hemoglobin (Hb F, α2γ2), is found in the developing fetus, and binds oxygen with greater affinity than adult hemoglobin. This means that a higher percentage of hemoglobin has oxygen bound to it at lower oxygen concentration, in comparison to that of adult hemoglobin. As a result, fetal blood in the placenta is able to take oxygen from maternal blood. Red blood cells, or erythrocytes, are the most common cell in human blood: about 5 billion are present in every millileter. The average life span of a red blood cell is abut 120 days. In the adult human, red blood cells are produced in the red bone marrow, but in the embryo and fetus, red blood cells are produced in the yolk sac, liver, and spleen. During the maturing of the red blood cells, they lose their nuclei and their mitochondrion, so they focus entirely on transport of oxygen and carbon dioxide. Red blood cells contain an average of 300 million hemoglobin molecules. Hemoglobin synthesis involves the coordinated production of heme, which is responsible for the reversible binding of oxygen, and globin, which is the protein that envelops the heme molecule and protects it. Heme is synthesized in the mitochondrion and the cytosol of the red blood cell when the nucleus (and DNA for synthesis) still exists. Iron deficiency impairs heme synthesis, thereby producing anemia. It is the most common cause of anemia. Inhibited heme synthesis, causing anemia, can also be caused by various drugs and toxins, as well as lead. When red cells reach the end of their life due to aging or defects, they are broken down, and the hemoglobin molecule is broken up and the iron recycled. When the porphyrin ring is degraded, the fragments are normally secreted in the bile by the liver. The major final product of heme degradation is bilirubin, a yellow waste product. Increased levels of this chemical are detected in the blood if red cells are being destroyed more rapidly than usual. Improperly degraded hemoglobin protein or hemoglobin that has been released from the blood cells can clog small blood vessels, especially the delicate blood filtering vessels of the kidneys, causing kidney damage. Iron is stored in the liver or recycled into new hemoglobin. Many species of leguminous plants, and some nonleguminous plants, are capable of taking atmospheric nitrogen from the air and converting it to nitrate for food for the plant. This process, called nitrogen fixation, occurs when special kinds of bacteria, often species of the genus Rhizobium, infect the roots of the plant and produce nodules there. Remarkably, these nitrogen-fixing nodules contain quantities of hemoglobin. Hemoglobin is otherwise unknown in the plant kingdom. The hemoglobin appears to enhance nitrogen fixation indirectly, by controlling the partial pressure of oxygen in the nodule. Decreased levels of hemoglobin, with or without an absolute decrease of red blood cells, leads to symptoms of anemia. Anemia has many different causes, although iron deficiency and its resultant iron deficiency anemia, are the most common causes in the Western world. As absence of iron decreases heme synthesis, and red blood cells in iron deficiency anemia are hypochromic (lacking the red hemoglobin pigment) and microcytic (smaller than normal). Other anemias are rarer. In hemolysis (accelerated breakdown of red blood cells), associated jaundice is caused by the hemoglobin metabolite bilirubin, and the circulating hemoglobin can cause renal failure. Mutations in the globin chain are associated with haemoglobinopathies, such as sickle-cell anemia and thalassemia. Sickle-cell anemia is a recessive genetic disease which causes a single amino-acid defect (a valine molecule replaces a molecule of glutamic acid) in one of the the protein chains of hemoglobin. This defect causes the red blood cells to become deformed when oxygen is scarce (as when the individual is exercising strenuously) and they combine with each other, forming blockages to blood flow at just the time when the body needs oxygen the most. As a result, people with sickle-cell anemia tend to have intermittent illness and have shorter than normal life spans. There is a group of genetic disorders, known as the porphyrias, that are characterized by errors in metabolic pathways of heme synthesis. King George III of the United Kingdom was probably the most famous porphyria sufferer. To a small extent, hemoglobin A slowly combines with glucose at a certain location in the molecule. The resulting molecule is often referred to as Hb A1c. As the concentration of glucose in the blood increases, the percentage of Hb A that turns into Hb A1c increases. In diabetics whose glucose usually runs high, the percent Hb A1c also runs high. Because of the slow rate of Hb A combination with glucose, the Hb A1c percentage is representative of glucose level in the blood averaged over a longer time (typically 3 months). Hemoglobin levels are among the most commonly performed blood tests, usually as part of a full blood count. Results are reported in g/L, g/dl or mmol/L. For conversion, 1 g/dl is 0.62 mmol/L. For example, hemoglobin levels are used in testing for glucose levels. Glucose levels in blood can vary widely each hour, so one or only a few samples from a patient analyzed for glucose may not be representative of glucose control in the long run. For this reason, a blood sample may be analyzed for Hb A1c, which is more representative of glucose control averaged over a longer time period. People whose Hb A1c runs 6.0% or less show good longer-term glucose control. Hb A1c values which are more than 7.0% are elevated. This test is especially useful for diabetics. Hemoglobin is by no means unique; there are a variety of oxygen transport and binding proteins throughout the animal (and plant) kingdom. 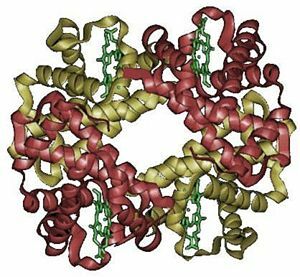 Other organisms, including bacteria, protozoans and fungi, all have hemoglobin-like proteins whose known and predicted roles include the reversible binding of gaseous ligands. Myoglobin: It is found in the muscle tissue of many vertebrates including humans, and especially common in diving mammals such as whales and seals (gives muscle tissue a distinct red or dark gray color). Myoglobin is very similar to hemoglobin in structure and sequence, but it is not arranged in tetramers, it is a monomer and lacks cooperative binding, and is used to store oxygen rather than transport it. Hemocyanin: It is the second most common oxygen transporting protein found in nature. Hemocyanin is found in the blood of many arthropods and molluscs. Hemocyanis uses copper prosthetic groups instead of iron heme groups, and it is blue in color when oxygenated. Hemerythrin: Some marine invertebrates and a few species of annelid use this iron containing non-heme protein to carry oxygen in their blood. It appears pink/violet when oxygenated, clear when not. Vanabins: Also known as Vanadium Chromagen, it is found in the blood of Sea squirts and are hypothesized to use the rare metal Vanadium as its oxygen binding prosthetic group; however, this hypothesis is unconfirmed. Erythrocruorin: It is found in many annelids, including earthworms. A giant free-floating blood protein, it contains many dozens, even hundreds, of iron heme containing protein subunits bound together into a single protein complex, with a molecular masses greater than 3.5 million daltons. Pinnaglobin: It is only seen in the mollusk Pinna squamosa. It is a brown manganese-based porphyrin protein. Leghemoglobin: This is found in leguminous plants, such as alfalfa or soybeans. The nitrogen fixing bacteria in the roots are protected from oxygen by this iron heme containing oxygen binding protein. Campbell, M. K. 1999. Biochemistry (Third Edition). New York, NY: Harcourt College Publishers. Di Maio, M., Pisano, C., Tambaro, R., Greggi S., Casella G., Laurelli G., Formato R., Iaffaioli R. V., Perrone F., and Pignata S. 2006. The prognostic role of pre-chemotherapy hemoglobin level in patients with ovarian cancer. Front Biosci 11:1585-90. Eshaghian, S., Horwich, T.B., and Fonarow, G. C. 2006. An unexpected inverse relationship between HbA1c levels and mortality in patients with diabetes and advanced systolic heart failure. American Heart Journal 151(1):91. Ganong, W. F. 2003. Review of Medical Physiology (Twenty-First Edition). New York, NY:Lange Medical Books of McGraw-Hill Medical Publishing Division. ISBN 0-07140-236-5. Hardison, R. C. 1996. A brief history of hemoglobins: plant, animal, protist, and bacteria. Proc Natl Acad Sci USA PMID 8650150. Kneipp, J., Balakrishnan, G., Chen, R., Shen T. J., Sahu S. C., Ho N. T., Giovannelli J. L., Simplaceanu V., Ho C., and Spiro T. G. 2005. Dynamics of allostery in hemoglobin: Roles of the penultimate tyrosine H bonds. Journal of Molecular Biology. PMID 16368110. Reece, J. B. 2005. Biology (Seventh Edition). Menlo Park, CA: Benjamin Cummings.